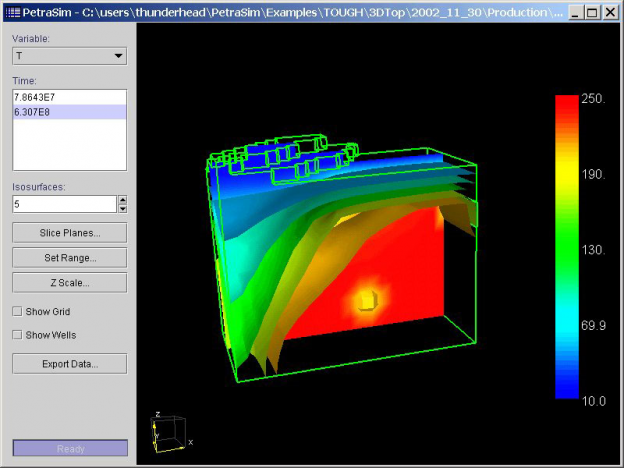 TOUGH2 is a general-purpose numerical simulation program for multi-phase fluid and heat flow in porous and fractured media. It belongs to the MULKOM family of codes, developed in the Earth Sciences Division of Lawrence Berkeley National Laboratory for applications in geothermal reservoir engineering, nuclear waste disposal, and unsaturated zone hydrology. TOUGH2-MP is a massively parallel (MP) version of the TOUGH2 code, designed for computationally efficient parallel simulation of isothermal and nonisothermal flows of multicomponent, multiphase fluids in one, two, and three-dimensional porous and fractured media. In recent years, computational requirements have become increasingly intensive in large or highly nonlinear problems for applications in areas such as radioactive waste disposal, CO2 geological sequestration, environmental assessment and remediation, reservoir engineering, and groundwater hydrology. The primary objective of developing the parallel-simulation capability is to significantly improve the computational performance of the TOUGH2 family of codes. The particular goal for the parallel simulator is to achieve orders-of-magnitude improvement in computational time for models with ever-increasing complexity. EWASG (included in the TOUGH2/T2VOC module) has been developed within the frame of a collaboration among Aquater SpA, an engineering services company of the Eni Group (now incorporated into Saipem SpA), the International Institute for Geothermal Research (IIRG) (now incorporated into the Institute of Geosciences and Earth Resources (IGG) of the National Research Council of Italy (CNR)) and the Earth Sciences Division (ESD) of Lawrence Berkeley National Laboratory (LBNL). Geothermal fluids usually consist of complex mixtures of water, salts and gases. As the thermodynamic and transport properties of such mixtures affect reservoir conditions and performance, the EWASG (Equation-of-state for WAter, Salt and Gas) module has been developed for the TOUGH2 multipurpose numerical reservoir simulator to handle three-component fluid mixtures of water, sodium chloride and a slightly soluble non-condensible gas (NCG). T2VOC is a TOUGH2 module for 3-phase flow of water, air, and a volatile organic compound (VOC). T2VOC was designed to simulate processes such as the migration of hazardous non-aqueous phase liquids (NAPLs) in variably saturated media, forced vacuum extraction of organic chemical vapors from the unsaturated zone (soil vapor extraction), evaporation and diffusion of chemical vapors in the unsaturated zone, air injection into the saturated zone for removal of volatile organics (air sparging), direct pumping of contaminated water and free product, and steam injection for the removal of NAPLs from contaminated soils and aquifers. TMVOC is a numerical simulator for three-phase non-isothermal flow of water, soil gas, and a multicomponent mixture of volatile organic chemicals (VOCs) in multidimensional heterogeneous porous media. It is an extension of the TOUGH2 general-purpose simulation program developed at the Lawrence Berkeley National Laboratory. TMVOC is designed for applications to contamination problems that involve hydrocarbon fuel or organic solvent spills in saturated and unsaturated zones. It can model contaminant behavior under “natural” environmental conditions, as well as for engineered systems, such as soil vapor extraction, groundwater pumping, or steam-assisted source remediation. TOUGHREACT v1.2 is an extension of TOUGH2 that couples chemical reactions to fluid flow. Coupled modeling of subsurface multiphase fluid and heat flow, solute transport, and chemical reactions can be used for assessment of waste disposal sites, acid mine drainage remediation, contaminant transport, groundwater quality, CO2 sequestration, and mineral alteration in geothermal systems. TOUGHREACT can be applied to porous and fractured media with physical and chemical heterogeneity. The model can accommodate any number of chemical species present in liquid, gas, and solid phases. A variety of equilibrium chemical reactions are considered, such as aqueous complexation, gas dissolution/exsolution, and cation exchnage. Mineral dissolution/precipitation can proceed either, subject to local equilibrium or kinetic conditions. Changes in porosity and permeability due to mineral dissolution and precipitation can be considered. PetraSim now includes limited support for TOUGHREACT v3.3, which can be purchased through LBNL. PetraSim currently creates TOUGHREACT v3.3 input files and simulations can be run through the PetraSim interface. To display results, TOUGHREACT output can be converted to PetraSim-compatible CSV files using this Online Conversion Tool. HydrateResSim (HRS) is a freeware, open-source reservoir simulator code available for use “as-is” from the NETL. HRS’ code was derived from an earlier version of the TOUGH+/Hydrate code. HydrateResSim simulates the behavior of hydrate-bearing geologic systems. By solving coupled equations of mass and heat balance, TOUGH-Fx/HYDRATE can model the non-isothermal gas release, phase behavior and flow of fluids and heat under conditions typical of common, natural CH4-hydrate bearing deposits (i.e., in the permafrost and in the deep ocean sediments) in complex formations. This entry was posted on June 8, 2017 by Alison Alcott.